Just when it seemed things couldn't get any worse ..
From the beginning, the season for the 49ers was going to be all about player development and progress, not about victories. No one expected them to win. A sign of hope would have been nice, however. Instead, what we have is what we saw Sunday. An offense that can't block, can't throw, can't catch, can't run. A defense that can't stop a weak offense. A 1-9 team that's hopeless today and shows no sign it won't be tomorrow, too. "Four or five weeks ago, you'd think things can't get any worse ... and somehow, we find a little bit deeper hole to sink into," tackle Scott Gragg said. "Is this team making improvement? I hope so, but it's tough to see that when you lose." Gragg is a thoughtful man and one of the few experienced NFL players on the 49ers' roster. So we'll help him out with the answer. The 49ers are not making improvement. They were not as good Sunday as they were when the season began. "Not close," coach Dennis Erickson conceded. "That's just a frickin' fact. I wish it wasn't." You'd like to hope this was bottom, this 35-3 loss to the Tampa Bay Bucs that would have been even worse but for a couple of interceptions courtesy Bucs quarterback Brian Griese. But, you previously might have thought the bottom was the shutout loss at Seattle in September or the horror show at Chicago in October, or last week's 34-point, four-turnover second-half meltdown against Carolina, and you would have been wrong. 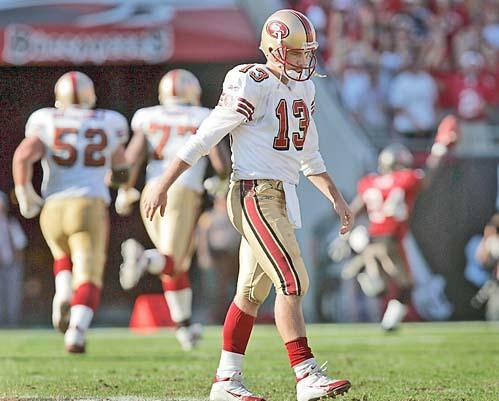 Against all odds, the 49ers have gotten worse. Poor Erickson. There are so many problems, the coach doesn't know where to start. "I don't think you could take one person or one thing," he said. Erickson is starting to question the effort some of his young players are giving. He's not the only one. "We probably could give a little more (effort)," said defensive tackle Bryant Young, the last survivor of the 49ers' last championship team. "We practice hard. We prepare. Maybe we do need to give a little more effort out there on the field. Who knows? I can't quite put my finger on that one thing." Of course not. No one can. It's like the kid with the finger in the dike. There are too many holes to plug. Tim Rattay started the game by holding the ball too long and taking sacks and losing a fumble. He didn't trust the offensive line's pass protection, and with good reason. Flustered, he then began throwing too soon, before receivers were into their routes, which he didn't trust them to run with precision, anyway. With 10 minutes remaining in the game, the 49ers had 23 net passing yards and Rattay had seven completions in 18 attempts. Not that he had much help. At one point, Kevan Barlow dropped passes on successive plays, and, at different times, both Barlow and Maurice Hicks waved at blitzers instead of blocking them. The running game was just as pitiful. Take away a 14-yard gimme on the last play of the first half, and the 49ers averaged 2.6 yards a carry. Did we happen to mention the defense? The Bucs, averaging 294 yards and 17 points a game, had more than 300 yards and 28 points barely five minutes into the second half. "It looks like we regressed this week," Erickson said. "I thought we were making progress. I didn't see that coming. The thing we've got to do the next six weeks is make progress. We have to become better offensively. We have to become better on defense. I've got to really look at it. What change can we make to make us more productive, to be more competitive? I think there's some lack of effort in some areas. If I see that in this game, there'll be changes made. I can deal with a lot of things, but that's not one of them." Unfortunately, there are no dramatic moves available to Erickson that will change the course of the year. There is no future Orlando Pace on the bench to move to left tackle, no future Peyton Manning waiting in the wings at quarterback, no future LaDainian Tomlinson for the backfield. Don't be surprised, however, if Hicks (36 yards on seven carries) begins to get significantly more playing time in place of Barlow (30 yards on 14 carries), who has done nothing to justify the $8 million in guaranteed money he got in his new contract. Hicks seems to give the 49ers at least a little burst of quickness when he gets into the game. One problem, one of many problems with this team, is that there is no leadership on the offense. Management took care of that when it gutted the roster in the offseason. Some of the young players just don't "get it," Erickson said, but there's no one in the locker room to help them get it. Of course, as the losing continues and the 49ers continue what seems an inevitable march to the No. 1 pick in the next draft -- which they'd probably trade away -- rumors will continue to mount about Erickson's job status. He insisted again Sunday, however, that, "I would like to see this through," and that he has no intention of walking out on the three years remaining on his contract. At the same time, he conceded, he didn't know how much more he could take. You could hardly blame him for that. "I know, personally, I can't handle this," Erickson said. "I've coached too many years and been too successful. This is horrible."